Gye Nyame: a symbol from Ghana considered one of the oldest glyphs in human memory. Some have suggested it is at least 5000 years old. “Nyame biribi wo sor” : good things come from above. GYE NYAME: “Except for God” recalls a time when none were present (pre-human history) “Except God”. From the Akan aphorism: “Abode santann yi firi tete; obi nte ase a onim ne ahyease, na obi ntena ase nkosi ne awie, GYE NYAME.” Literal translation: “This great panorama of creation dates back to time immemorial; no one lives who saw its beginning and no one will live to see its end, EXCEPT GOD.” Akan: SUPREME BEING, the CREATOR who they refer to by various names: OBOADEE, NYAME, ONYANKOPON TWEREAMPON to list but a few. Some have said it is the oldest monotheistic symbol known. However this idea suggests a simplification of theology and thus it would be better to do more research into the the religion(s) from which it springs. 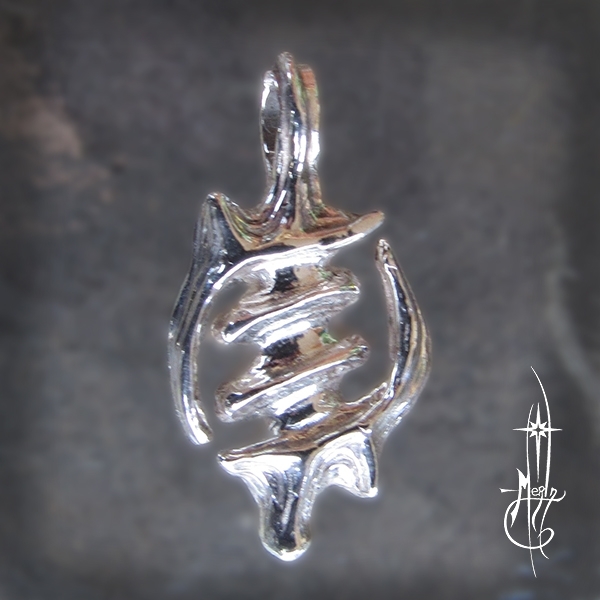 The Gye Nyame Tao Amulet is heavy for it’s size: 1 1/4” tall with a top bail for hanging on a cord or chain. I carved terraces to give depth and catch the light, giving it a Tao-like feel of wood grain or perhaps ocean waves. I have been told this is often offered to young women when “coming of age” stepping into adulthood. However everyone enjoys wearing this powerful symbol. One finds variations of this symbol throughout Ghana in textiles, sculpture, carved into doors and passages through out the country. 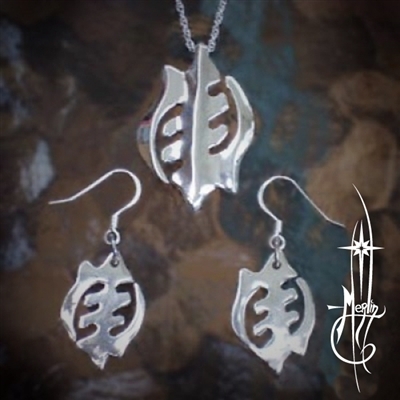 To see the entire collection of Gye Nyame jewelry, please visit my Gye Nyame Collection page. Not see whhat you want? Check out Amulets by Merlin and my How to order Custom page. suggests that good things come from above. This unique and beautiful symbol is omnipresent in Ghana. the symbol of the Omnipotence and Omnipresence of God. with a bail through the top point allowing a chain or cord to pass through. well over 5000 years old. from the continent of humanities’ cradle.